The Courtland-Gleeson mining region, otherwise known as the Turquoise district, is situated in the south-central part of Cochise County, southeastern Arizona, about 15 miles east of Tombstone, 20 miles north of Bisbee, and 30 miles south of Cochise. This 79-page report describes the geologic setting and ore deposits of the area. 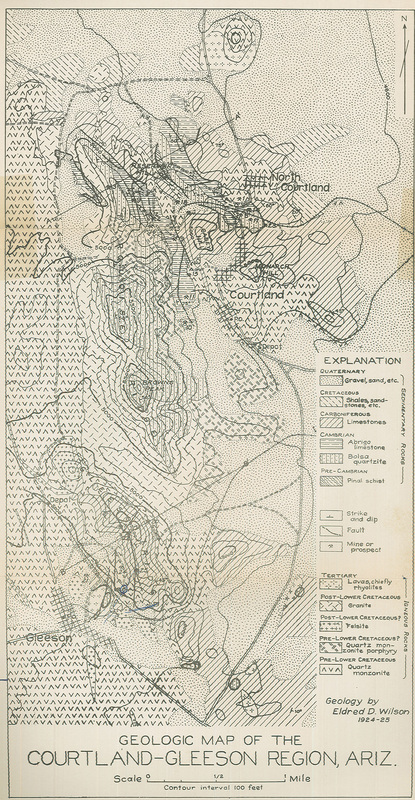 Wilson, E.D., 1927, Geology and ore deposits of the Courtland-Gleeson Region, Arizona. Arizona Bureau of Mines Bulletin B-123, 79 p., 3 plates.